In the early decades of the 20th century, the US Navy made plans to fight many potential enemies. Plan Red, the strategy for war with Britain, included sub-plans for conflict with British Dominions. War with Australia, code-named Plan Scarlet, would be a purely naval affair. 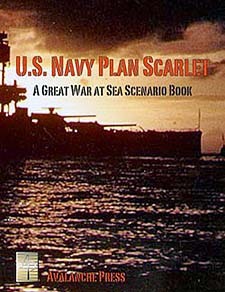 US Navy Plan Scarlet is a 64-page book supplement to the Great War at Sea series, focusing on the battles that could have taken place in the Central Pacific. There are 25 scenarios, or separate game situations, and of course the thorough background articles you've come to expect from our supplements. This module is not playable by itself, but requires ownership of Pacific Crossroads, Jutland, Cruiser Warfare and US Navy Plan Gold boxed games and Sea of Troubles, Black Waters and Zeppelins books to enjoy all of the scenarios.